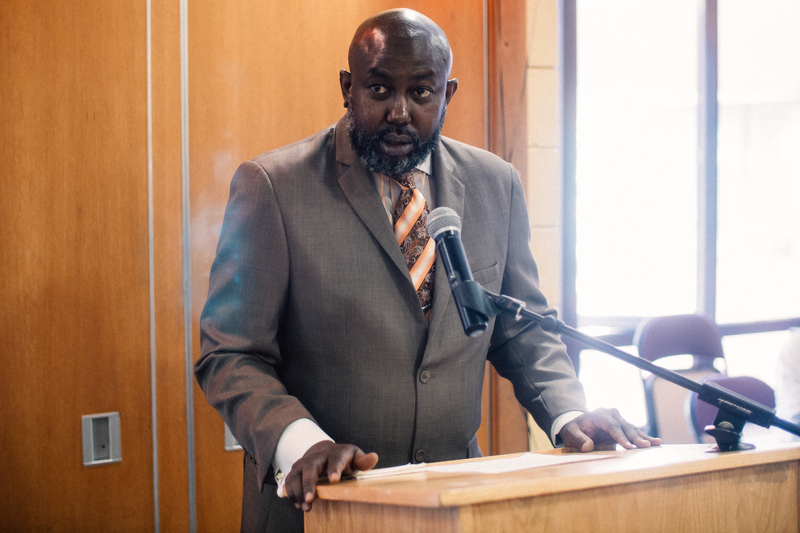 Club President of Veteran Affairs Samuel Williams Jr. Photo credit: Adisa Sobers. Three City Council citations were awarded to three people for the work they do for veterans at York’s first ever annual Veterans Luncheon on Nov. 8. 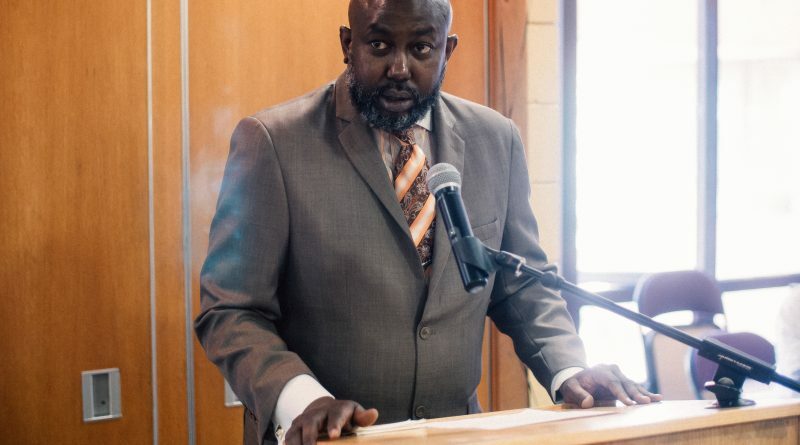 Anthony Andrews, a Higher Education assistant for Student Activities, gave out the awards to Councilwoman Adrienne Adams, Larry Eaton, the director of Veterans Affairs and, Samuel Williams Jr., president of the Veterans Affairs Club. The luncheon was hosted by the Office of Veterans Affairs at York to celebrate all veterans, especially student veterans. State Senator Leroy Comrie and U.S. Representative Gregory Meeks were also in attendance at the event. Senator Comrie said that despite the terrible state that the country is in right now, Americans can all have a better future. Comrie continued his speech by inviting people to his office to talk about veterans issues and ways that people can solve these issues. “Seeing the world through a veteran’s eyes will make us better people,” said Comrie. He added that he hopes to work closely with veterans programs and to accomplish his goal of creating a full-service hospital for Veterans. York College’s Vice-President for Student Development Vincent Banrey stressed the importance of veterans as the real heroes of the country. He said his visit to Omaha Beach in Europe left him with a profound memory seeing the sacrifices veterans had made just for this country. Omaha Beach was one of several locations where Allied forces fought German troops during the D-Day invasion on June 6, 1944, the turning point for World War II in Europe. Representative Meeks said that Veteran’s Day is the most important holiday and that it is one taken for granted. He said some veterans are willing to fight for a country that wouldn’t even fight for them. But, these veterans nevertheless still fight to make this country better, regardless of what it is going through. Meeks said that he’s going through various interviews with people who want to join the Military Academy and encourages people to join. Military Academies are educational institutions which prepare candidates for service in the officer corps. Some of these academies include United States Military Academy at West Point, N.Y. and the United States Naval Academy at Annapolis, Md. Susan Slout, the president of the Veterans for Peace program, mentioned her work as a veteran. She stressed the need for U.S. citizens to take care of veterans. Veteran for Peace is a global organization of military veterans and allies whose collective efforts are to build a culture of peace. The organization meets monthly. Slout said that their current project is to save the veterans program from becoming privatized. Larry Eaton was introduced to the sacrifices that veterans face when he joined ROTC (Reserve Officer Training Corps) in college. Eaton also said that he is available to help veterans with the transition from being in the military to going to school. “Not only are our veterans serving and coming home, but they are also getting degrees, getting jobs, making careers, and building families,” said Eaton. He encourages veterans to stop by 2B04 for resources, computer time, or housing, benefits and job assistance.